Dr. Athanasios Stoyioglou is board certified in Interventional Cardiology, Internal Medicine and is Certified by the Board of Nuclear Cardiology in Nuclear Cardiology. He completed his fellowship in Interventional Cardiology and Cardiovascular Medicine at Lenox Hill Hospital in New York, New York where he also completed his residency. 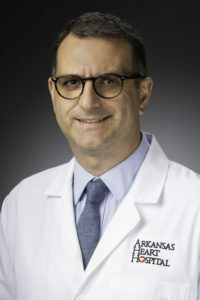 Before joining Arkansas Heart Hospital, Dr. Stoyioglou served as an Interventional Cardiologist at White River Medical Center in Batesville, Arkansas. His experience spans both locally, nationally and internationally as he started his career as a primary care physician in the Greek Navy. Dr. Stoyioglou is a Fellow of the American College of Cardiology and is excited to call El Dorado home.